On March 26th the SIPU Evaluation Unit launched its first event in a seminar series to celebrate the Year of Evaluation 2015. 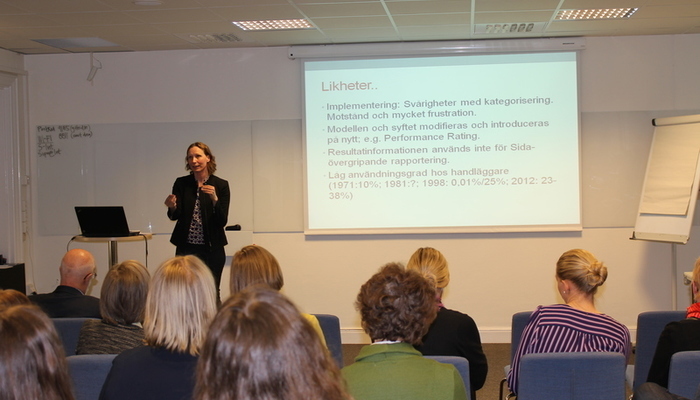 Janet Vähämäki presented her thesis “The Rise and Fall of Results Management Reforms in Swedish Development Cooperation” that examines consequences of the results agenda in the management of development cooperation. The presented paper is part of the book "Politics of Evidence: Playing the games or changing the rules? ", that will be published later this year. The paper explains and examines how Sida several times since the 70's has tried to introduce a stronger results focus and how this has resulted in a re-introduction of management tool i.e. the Logical Framework Approach . It concludes that although there might be factors that support success of the current effort, these changes may however hamper achievement of development results on the ground and be just another 'tide of reform'. The event was well attended by people from academia and civil society as well as evaluation experts and senior Sida officers. An interesting discussion followed the presentation based on the long-term experience of the participants and focused on the change of management culture and transparent dialog at Sida.